A suicide bomber in north-eastern Nigeria has killed four people and injured other commuters at a bus station, witnesses have told the BBC. He drove a car into the station on the outskirts of Potiskum in Yobe state, called over a girl selling water and then triggered the explosion, one said. Potiskum has come under attack several times in the past from Islamist Boko Haram militants. Last Sunday, two female suicide bombers targeted a market in the town. 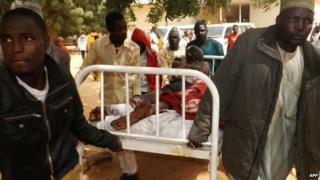 That attack, in which four people died and more than 40 were injured, was blamed on Boko Haram - it has not commented. Yobe is one of three states in north-eastern Nigeria which has been under a state of emergency for the last 20 months in a bid to end the Islamists' six-year insurgency. But in that time militant Islamist group has managed to seize control of a number of towns and villages in the area as part of its campaign to impose an Islamic state. A man taking part in the rescue effort at Potiskum General Hospital told the BBC Hausa Service that he had seen five bodies, including that of the bomber, after the attack on Sunday morning. He said that about 30 people were also injured as a result of the car bomb in the mainly Muslim town, which is Yobe state's commercial hub. Both witnesses asked for their names to be withheld for their own security. On Friday, Ghana's President John Mahama said that African leaders would discuss plans this coming week to "deal permanently" with Boko Haram militants and a multinational force may be considered. The group has begun threatening Nigeria's neighbours and launched a raid on a military base in northern Cameroon earlier this week. Thousands of people have also been fleeing from Nigeria to Cameroon and Chad because of the militants' attacks. Earlier this week, Amnesty International released satellite images of towns near Lake Chad attacked by Boko Haram this month which suggest widespread destruction and a high death toll. The pictures showed about 3,700 structures damaged or destroyed in Baga and neighbouring Doron Baga in Borno state. Nigeria's government has disputed reports that as many as 2,000 people were killed in and around Baga, putting the number of dead at no more than 150.